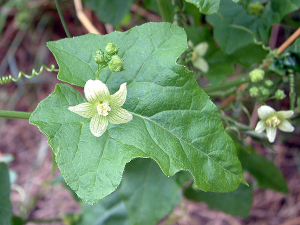 Observation - White Bryony - UK and Ireland. Description: Climbing through Bramble and Holly in an old hedge. Known by several common names, including English Mandrake and Wild Hops. Climbing through Bramble and Holly in an old hedge. Known by several common names, including English Mandrake and Wild Hops.